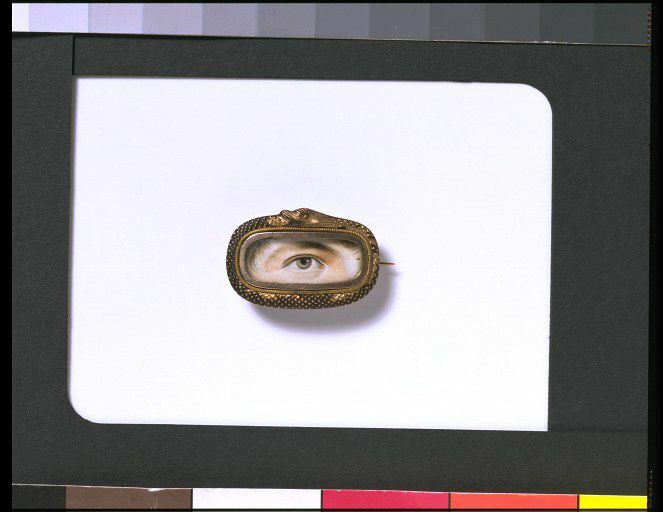 Eye miniatures were a curious but brief anomaly in miniature painting that came into fashion at the end of the 18th century. They were an extremely intense manifestation of an already emotionally charged art, apparently an attempt to capture ‘the window of the soul’, the supposed reflection of a person’s most intimate thoughts and feelings. Often, as here, the result was a compelling piece of jewellery. Sometimes, however, the result was merely unpleasantly anatomical or disturbingly uncanny. The eye is one of the oldest and most powerful symbols used by man. In Italy one often finds a large eye gazing down from a cupola, the all-seeing eye of God, and the Masonic Order, for example, adopted the eye as its symbol. In France, where the eye miniature seems to have originated, the eye as symbol of watchfulness was adopted by the state police for buckles and belts. During the Revolution of 1789 it was apparently adopted by adherents of the Revolutionary party to signal a member's allegiances to initiates. In Britain it seems to have had a much more innocent role as a love token, with some eye miniatures even glistening with a trompe-l'oeil tear, or even a diamond set to imitate a tear. 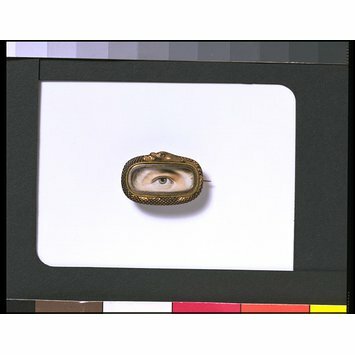 Most eye miniatures are unsigned, due to the minuteness of the background, and all too often the name of the person whose eye is depicted is unknown. Oblong frame shaped as a snake swallowing its tail. Brown/yellow iris. Close-up of face. 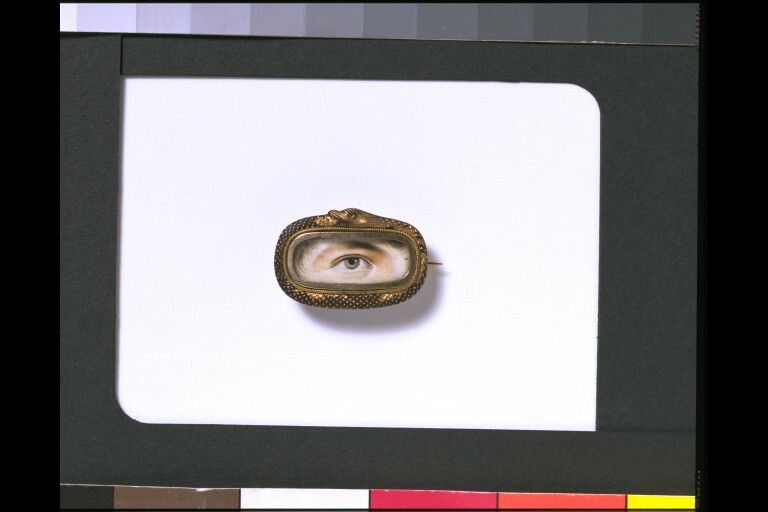 This eye miniature is illustrated on Fiche 36, C/4 of Miniatures microfiche.